The Osprey was a rare breeder in Tennessee before the development of large reservoirs in the 1900s. In 1975, the Osprey was listed as Federally Endangered due to a great decline in population as a result of poor nesting success due to contamination from the pesticide DDT. Following the ban on the pesticide, and facilitated by an aggressive hacking (releasing young bird into suitable habitat) program by TVA and TWRA and across their range, numbers have rebounded and the bird was removed from the Threatened list in 2000. It is now locally common in summer, uncommon during migration, and rare in the winter. Most Ospreys migrate to Mexico, Central and South America for the winter, but many overwinter on the southern coasts of the U.S. The Osprey has a slender body, long wings and long legs. Both sexes: dark brown above, white below, with a white head that has a prominent dark stripe through the eye. In flight, the long narrow wings are bent at the wrist, showing a distinct dark patch. 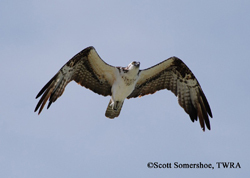 In the summer, the Osprey is found along rivers, lakes, reservoirs and the coastal areas of the U.S. and Canada. Live fish, fresh or salt-water, is 99% of the Osprey’s diet. Usually the catch is from 6-13 inches in length and weighs from 1/3 to 2/3 of a pound. Osprey rarely eat fish carcasses, birds, snakes, or small rodents. The Osprey spends the day perching on a water-side tree snag or other structure, or gliding 30 to 100 feet over the water to hunt. When a fish is sighted, it hovers, before diving with feet outstretched and eyes sighting straight along its talons. Sometimes it briefly disappears below the surface of the water with only the wingtips showing before rising out of the water with its catch locked in both feet. It pauses in mid-air to arrange the fish so that the head is facing forward, reducing air resistance, and facilitating the flight back to its perch or to nest. Osprey do not begin breeding until they are at least 3 years old. In Tennessee, birds arrive back in March, with breeding beginning in late March to early April. The male begins courting with aerial displays and by bringing food or nesting material to the female. He will feed her even before she lays eggs and throughout the season. Once paired, these birds remain monogamous and usually return each year to the same site, adding to the nest year after year. Ospreys nest singly or in colonies. Though vigorous in chasing off other Osprey or predators that encroach on the nest site, they defend only the immediate area surrounding the nest rather than a large territory. Favored nest sites are located in open areas for easy approach and near an adequate food source. Nests are built in trees snags, treetops, cliffs or human-built structures such as power line poles, cell phone towers, duck blinds, river markers and pylons, and nesting platforms. Nests are built of sticks and lined with bark, sod, grasses, vines, algae or other aquatic plants gathered by the male and arranged by the female. The nest is used for several years and new materials are added each year. After generations of adding to the nest year after year, the Osprey nest can be 10 feet deep and 6 feet in diameter, although nests rarely get that large in Tennessee! Clutch size: 2 to 4 cream or pinkish cinnamon eggs with reddish brown spotting. Eggs do not hatch at the same time. The first nestling can emerge up to 5 days before the last one. The oldest nestling dominates and will monopolize the food brought by parents. If food is not abundant, the younger siblings may starve to death. Incubation: Both parents incubate for 32-43 days. Fledging: While the nestlings are very young, the female parent stays with them and the male brings the food. Both parents feed after nestlings are about 28 days old. Nestlings fledge after 51-59 days. 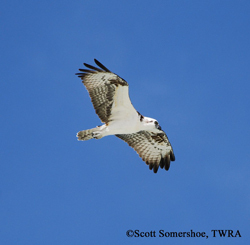 In October, Tennessee Ospreys migrate to their winter territories, where the young remain for the first 2 years. At 3 years, breeding birds return to nest to within a few miles of their natal area. The Osprey is quite vocal giving short, high-pitched whistles: “tewp, tewp, tewp, teelee, teelee, tewp”. Also a loud and shrill slurred whistle: “teeeeaa” that rises in intensity and then falls away. Alarm call can build to a wavering squeal. 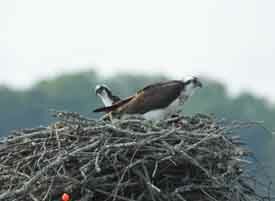 The Osprey will readily build its nest on nest platforms designed especially for them. These platforms have become an important tool in reestablishing populations. In some areas nest are placed almost exclusively on artificial structures. We recommend placing nesting platforms on poles in open water at least 100 feet from tall trees. AVOID putting platforms up on land to reduce predation from mammalian predators like raccoons. If a platform must be erected on land, we recommend single pole structures with a platform on top. Single poles are easily outfitted with a predator guard (inverted cone, or a sleeve of aluminum flashing) that prevent raccoons from climbing into the nest. A raccoon has been seen climbing into a 30-foot high nest, so a guard is necessary on allo land based platforms. On mainland areas and any area where raccoons and other predators are present, single pole structures with a platform on top and a predator guard are recommended. Raccoons have been observed climbing 30 feet to a nest. A sleeve of aluminum flashing or an inverted aluminum cone is suggested. To an Osprey, an attractive nest site includes a nearby perch. The male often perches either on the nest, or within 20-40 feet. A perch pole that rises at least 4 feet in diameter and placed nearby is ideal. Or, a 2x4 that rises 2 to 3 feet higher on both sides of the nest platform can be added to the platform. Nest platforms and poles should be placed in or adjacent to shallow lakes, rivers, or wetlands, where Ospreys are regularly observed. Although Ospreys have exhibited tolerance of disturbances, such as boat traffic on waterways, it is not recommended to place a nest platform in a very developed area. Adults may abandon the nest if the disturbance is too great, especially during the egg-laying period. Even while the chicks are being fed by the parents, it is important to observe the nest from a safe distance that does not cause a reaction from the adults.